Winged Nike over Panathinaikon Stadium, Acropolis in background. 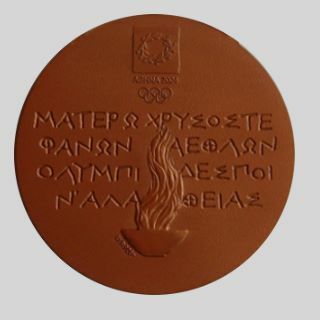 The Olympic medals for the Athens Games were presented on 2 July 2003. This presentation was the final step in a long process that involved nine Greek artists who kindly accepted the invitation to participate in a design tender for the creation of the Athens medals. Elena Votsi submitted the winning entry. Since the Amsterdam Olympic Games in 1928, the medals main side had kept more or less the same design. 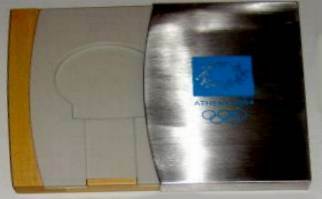 ATHOC`s aim was to modify this main side in order to include Greed elements that would highlight the close bonds between Greece and the Olympic movement. 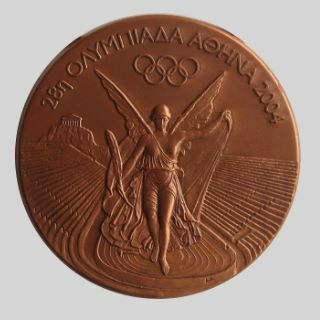 Therefore, candidates were asked to include the goddess "Nike" of Paeonios and the Panathinaiko Stadium in their design ffor the main side of the medal. "Nike" of Paeonios is a statue exhibited in the museum of Ancient Olympia and is a direct reference to the Greek origin of the Games. The statue, created in 421BC by the well- known sculptor Paeonios, depicts the goddess "Nike" who was worshipped in ancient times as the personification of victory, in the stadium as in the battlefield. Historical research showed that the goddess "Nike" was always presented as "winged", descending from the gods to sing praises and crown a winner.The Panathinaiko Stadium, also presented on the main side of the medal, highlights the revival of the Olympic Games which took place in 1896 in this venue. On the reverse side, three elements are depicted. The eternal flame that is lit in Olympia for every Olympic Games, the opening lines of Pindar`s Olympic Ode composed in 460BC to honour an Olympic wrestling winner, and the Athens Games emblem.After the presentation of the Athens medals, the IOC approved their new design and decided to adopt it for the Games to come. The look of the Olympic medals was completed with the multicoloured ribbon which was designed bearing patterns from the Panorama graphic and the ATHENS 2004 logotype.